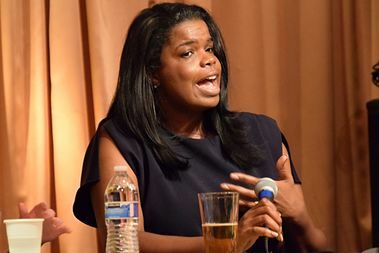 Cook County State's Attorney Kim Foxx discusses the impact of President Donald Trump's immigration orders at The Girl Talk Wednesday night. CHICAGO — Undocumented immigrants who have been victims of crimes increasingly aren't showing up to court as they fear deportation, creating a "chilling effect" on Chicago's immigrant communities, Cook County State's Attorney Kim Foxx said Tuesday. Foxx discussed the local impact of President Donald Trump's immigration orders at The Girl Talk, a monthly talk show highlighting influential Chicago women at The Hideout, 1354 W. Wabansia. Despite Chicago's sanctuary city status, some undocumented immigrants who are victims of domestic violence or are in other vulnerable positions aren't showing up for court in Cook County, leaving them susceptible to more abuse, Foxx said. "In this climate, we have people who are being victimized who are afraid to come to court because they are afraid they are going to get deported," Foxx said. "A democracy that people are hurt [and] are afraid to seek reprieve from harm because we've set up an environment where we are telling them, 'We will punish you,' is not justice at all." And their fears of being picked up by U.S. Immigration and Customs Enforcement agents in court are legitimate, Foxx said. In February, federal ICE agents detained a woman in the U.S. after she received a protective order against an allegedly abusive boyfriend at a Texas courthouse. "That has a chilling effect on women who are being abused who will not come to court now because they saw that somewhere," Foxx said. "That's a problem for me." Foxx, a sexual abuse survivor, said that the orders launched by the Trump administration have affected her office's ability to reach people who may need help. "I'm an advocate on behalf of people who have been wounded or aggrieved," she said. "To be seen as someone who cares about helping those who have been wounded, [and] the wounded afraid to participate in the system because of the tension that has been created on the federal level, has been really heartbreaking to me," Foxx said. Erendira Rendon, a community organizer with the Resurrection Project in Pilsen, said immigrants are often scared to report crimes, even in sanctuary cities like Chicago. Determining who to trust can be difficult; while Chicago Police Department officers and Cook County prosecutors don't cooperate with ICE agents, the state police and other surrounding law enforcement agencies do. Immigrants "don't have any confidence that an interaction with the police will not lead to deportation," Rendon said. Failure to report crime can have a ripple effect on the rest of the neighborhood, Rendon said, as assaults and other crimes go unreported. The Cook County State's Attorney's office is working with immigration advocacy groups to prosecute criminals who prey on undocumented immigrants, most recently creating a new hotline for residents to report related fraud. Residents can call 312-603-8678 to anonymously report cases of suspected immigration fraud. Calls are confidential and federal authorities will not be contacted. Promising to reform the office in the wake of the Laquan McDonald case, Foxx was elected in November 2016 after defeating Cook County State's Attorney Anita Alvarez in the primary in March 2016.